On a warm April evening in New York, a Pakistani woman holds an audience captive at the Asia Society in the Upper East Side. Sitting cross-legged and barefoot on a red Persian rug, she leads a sama (an experiential Sufi ceremony celebrating God) accompanied by four male musicians playing the tabla, harmonium, sitar and dholak. The woman, Sanam Marvi, wears a black, red and gray shalwar kameez with a translucent red chiffon scarf draped across her body. Her loose medium-length black hair frames her face. Her only adornments are a silver watch, a gold bracelet, small studded hoop earrings and her voice — a rich, deep belting voice that ricochets off the walls of the small auditorium and pierces New York reserve. Some audience members sway; some shout out praise and/or comments. The majority clap loudly in time with the music. The five songs she sings bookend a three-way question-and-answer session about Sufi music, led by Rachel Cooper, a director at the Asia Society. Fellow performer Arieb Azhar fluidly translates Cooper’s questions from English to Urdu, and Marvi’s response from Urdu into English. Marvi’s repertoire draws on a long history of Sufi verse and music in the Indian subcontinent dating from the 13th century. It was during the Delhi Sultanate that “ecstatic” Sufi practices became popular and were the reason many people converted to Islam. Such practices became a key feature of religious ceremonies at shrines and dergahs where even today, they continue to draw people from all religious backgrounds.The primary themes of religious love and devotion in Sufi poetry can be understood purely at a secular level — in the same way the poetry of Sufi mystic Jalal’uddin Rumi can. Poems with seemingly hedonistic themes, such as getting drunk and frequenting taverns, are implicitly spiritual. It is perhaps because of Sufi music’s appeal to both religious and secular audiences that it has become popular in and beyond South Asia. One of the most well-known genres of Sufi music from Pakistan, India and Afghanistan is qawwali. The term refers to someone (qawwal) who repeats or sings an utterance of the prophet (qaul). Sufi saint Amir Khusrau of Delhi is credited with creating qawwali music through integrating Arabic, Indian, Persian and Turkish music traditions. Qawwali music is structured in a particular way to generate an experiential effect on the listener. The music starts off gently and then builds into a passionate climax. Thus, purely on a sonic level, a listener can be moved to intense emotional highs. Many listeners will also be incited to clap, sway and/or dance. Although qawwali may the best-known type of South Asian Sufi music in the West, there are many different types. For example, a manquabat is a song in praise of Imam Ali or a Sufi saint; a ghazal is a love song that may talk about the agony of separation from the beloved and sounds secular at face value; while a kafi is a poem in Punjabi, Siraiki or Sindhi — a style employed by celebrated poets such as Bulleh Shah and Sachal Sarmast, whose work Marvi draws upon extensively in her performances. 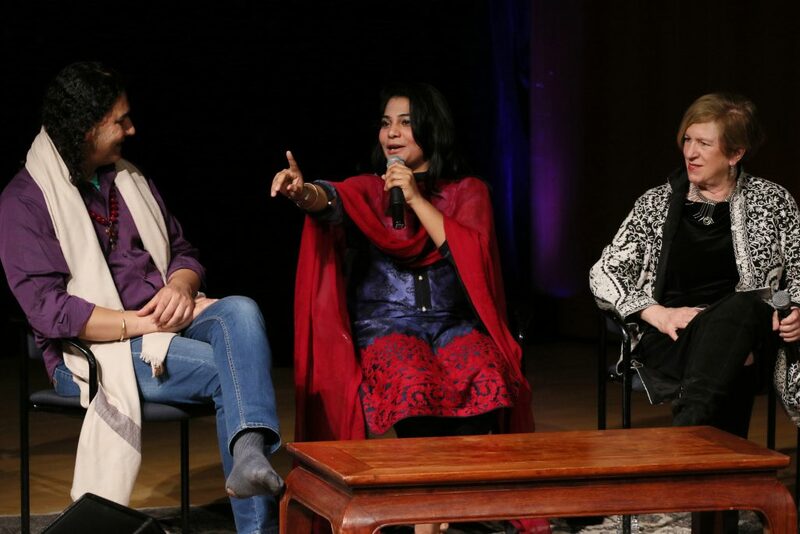 When I sat down with her and Azhar the next afternoon at the Brooklyn Academy of Music (BAM) in Brooklyn, she admits that she has a special relationship with the work of Sachal Sarmast, a poet from Marvi’s province of Sindh. Dressed in a white and pale green cotton kameez and tapered white trousers with a black and brown shawl thrown over one shoulder, her unmade face appears much younger than her 31 years. “I see all the poets as the same as they all have the same message, but I do have a special connection with Sachal Sarmast. He wrote in Siraiki,” Marvi says, referring to the dialect spoken in the Punjab province. Consequently, her favorite time to perform is at Sarmast’s urs, an event that commemorates the anniversary of the death of revered saints and poets, as well as the urs of Shah Abdullah Latif Bhittai, a Sindhi poet and saint. Marvi grew up in the city of Hyderabad in Sindh and is one of a handful of famous female Sufi singers and a household name in Pakistan. Her road to success has been a lifelong journey. She admits it was a path she knew she wanted to traverse from a young age. This inclusive message is threatening to those who seek to use religion as a divisive tool, not least in Pakistan where celebrated Sufi singer Amjad Sabri was killed by the Pakistani Taliban in June. His father, Ghulam Farid Sabri, was one half of the internationally renowned duo the Sabri Brothers. Moreover, in February, 88 people were killed in a terrorist attack at the shrine of Sufi saint Lal Shahbaz Qalandar in Sehwan, Sindh. 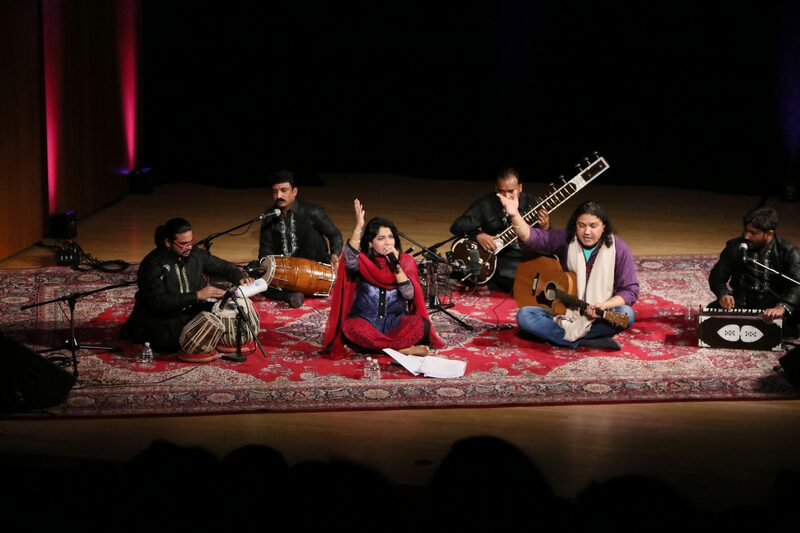 The saint is commemorated in the popular song O Laal Meri Patt (also known as Dama Dam Mast Qalander), a song that Marvi performs as her finale on both nights in New York. She has also found time to contribute music to rom coms London, Paris, New York (2012), Ishq Khuda (Love is God), and numerous television series, despite once expressing a “mild disdain for popular music,” according to BAM’s program notes. Her forays into the film and television industries are in line with a trend that has seen the increasing popularity and commercialization of South Asian Sufi music. Pakistani Sufi musician Nusrat Fateh Ali Khan paved the way: He became internationally renowned after signing with the Real World label, collaborating with British singer Peter Gabriel, and performing live at World of Music, Arts and Dance festivals. Such commercialization is not without its critics, who believe the spiritual and commercial are at odds with one another. Indian Sufi singer, lyricist and composer Madangopal Singh — in an interview with The Hindu newspaper — said that Sufi music was “getting aggressively appropriated by inhabitants of lifestyle pages.” He goes on to say that singers will sing Sufi songs anywhere as long as they’re paid for it, and this violates the Sufi spirit. However, Syed did feel that understanding the meaning of the poetry was essential. “If you do not understand the [spoken] language or [written] text, it’s not going to be understood. If it’s translated, it’s understood.” But she emphasized a caveat. “They [listeners] must know the context of the language and culture. You can’t understand the poet Bulleh Shah if you haven’t lived in that country and gone through the hardships that these Sufi poets are addressing. 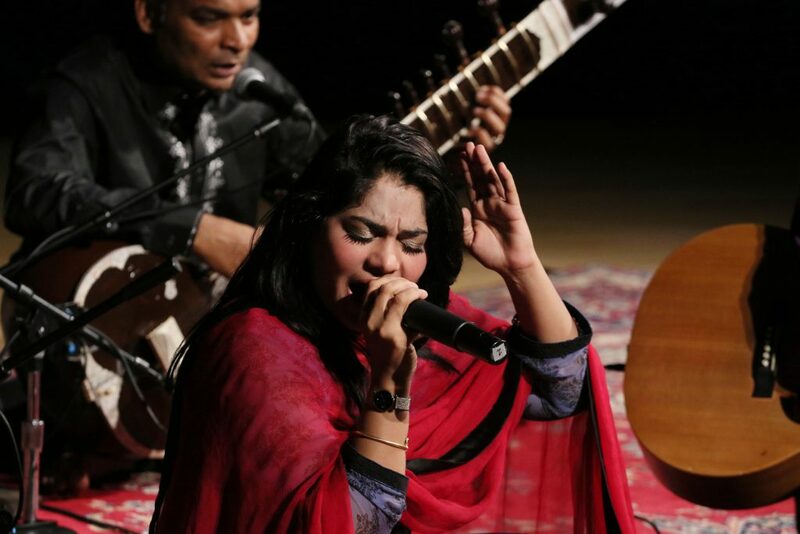 You can’t get a translation of those things.” She expressed her belief that the type of Sufi music that Marvi sings can primarily be understood by those with roots in the Indian subcontinent, rather than Westerners who don’t have any links. But this does not mean that Sufi music cannot affect Western audiences in other ways. However, there is an interesting dichotomy between the different audiences: Those who are not from the South Asian diaspora quietly observe, and those who are familiar with the genre make virtually all the noise. One thing is clear though, regardless of whether people understand what she is saying, everybody is enjoying the ride. *All images by E.H. Wallop, courtesy of Asia Society. Syma Mohammed is a journalist who is passionate about profiling people and interested in the intersections of gender, race, and religion. She has a master's in gender studies from New York University. Her Twitter account is @Syma_M.